What are Server level Redirects and how do I setup Redirects ? Redirects are server side rules to handle incoming requests and redirect them for your visitors. The WPOven redirect tool redirects any incoming request for a Domain which is not added to your WPOven dashboard and redirects it to the destination set by you. How do I setup Redirects ? Step 1 : Access the Redirect section. 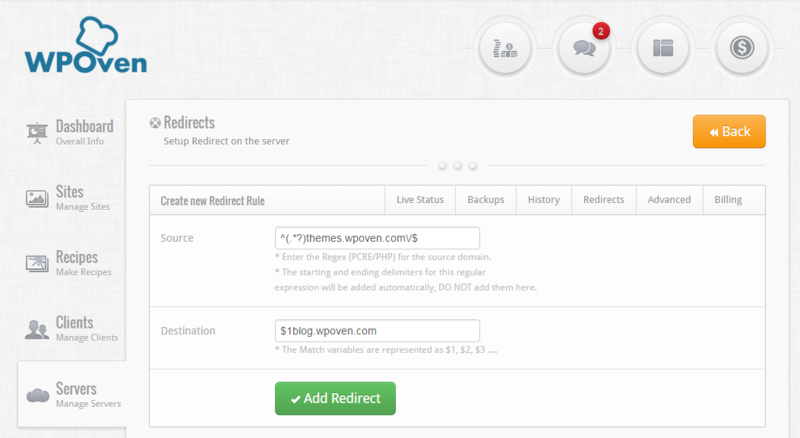 The redirect section can be accessed from your WPOven dashboard, from the ‘Server‘ section. You need to select the server to which you want the request to redirect to. Now in this section, you will notice the ‘Redirects’ tab. Click on the ‘Redirects‘ tab to setup the redirect rule. Step 2 :Create a Redirect. Once you open the ‘Redirects‘ section, you will see the Redirect Manager. 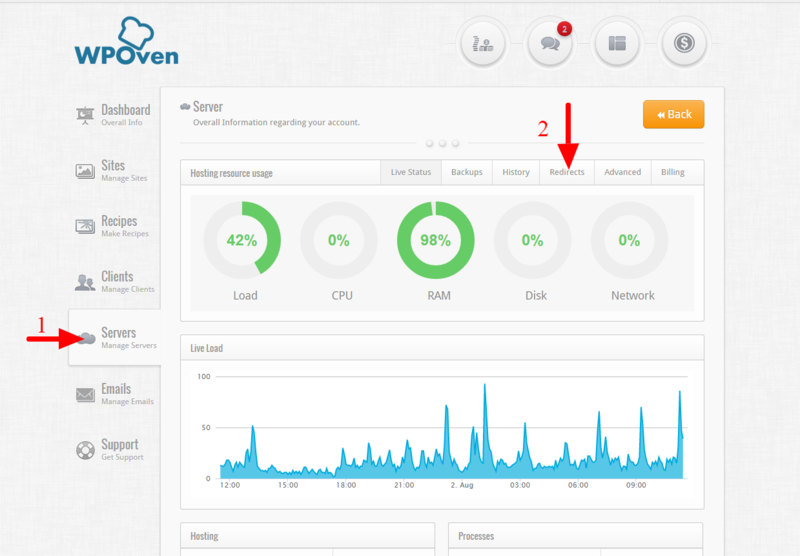 Here you will be able to see all the redirect rules that you have setup for this server. Source : This field will take the regular expression for the URL you wish to redirect from. Also note that the domain for this URL should not already be added to your WPOven dashboard, otherwise the redirection will not work. The path entered should be a PCRE/PHP regular expression (you can learn about Regular expressions here) and it should not include any starting or ending delimiters. The ‘^’ indicates the starting of the regular expression and ‘$’ the end. Destination : Here we will enter the destination path where the visitor will be redirect to,If you wish to add the matched variables from the regular expression from the source field, you can enter them as $1, $2, $3 …..
Once you have entered both the fields, press the ‘Add Redirect’ button to save the redirect. 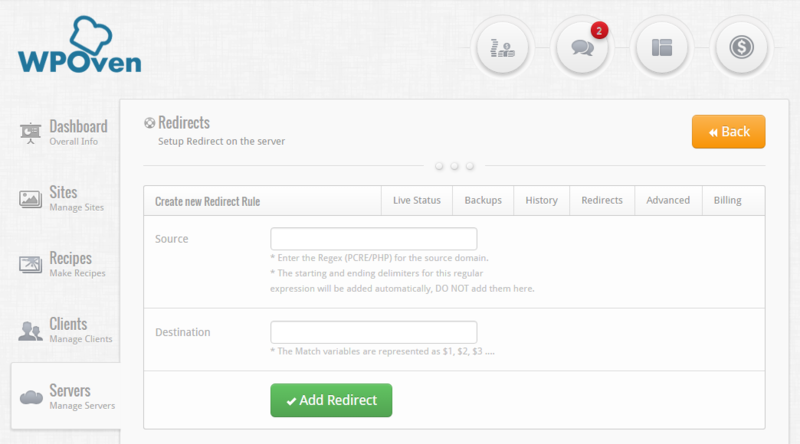 You should now be able to see your redirect on the Redirect Manager page for the server. To edit an already existing Redirect, you can simply click on the ‘Manage’ button from the Redirect manager page. In case you are not able to setup the redirect or require any assistance with it, please feel free to contact our support team. They will be happy to help you.